Last month, I taught a two-day workshop in the heart of Phoenix. While there, I was able to get some friends to come out and help create a behind-the-scenes video of the entire workshop. I was also able to meet with Tether Tools, whom are located in Phoenix, and they gave us access to some pretty cool tools, more specifically, my new favorite BTS tool, the Tether Tools Look Lock. Like most people, I have an old GoPro that is rotting away on my desk. My Hero 3 Black Edition was purchased when it was first released. I saw the promo video and was completely sold on the idea. However, upon its arrival, I discovered the horrifying truth: I'm not a professional snowboarder, basejumper, or surfer, so my videos will never be quite as cool as those I saw. Since then, the GoPro has kind of just sat there. Occasionally picked up, only to brush the dust off of it, my GoPro Hero3 has largely gone unused, and lost value with the release of newer models. While I've wanted to use it for behind-the-scenes videos, I never wanted to sacrifice my coolness by forcing myself to wear a headband or other attachment. Then I found the Look Lock by Tether Tools. For me, Tether Tools has always been an interesting company that I don't know much about. I've shot tethered in the past, but I often like to move around too much to really see the value in it. It never occurred to me that they made more than just tether cables. The Look Lock is a simple little contraption that allows you to mount items to a small boom arm extending out from your camera. While the selling point on their website is to use iPhones to get the attention of small children, it also works brilliantly for holding a GoPro. 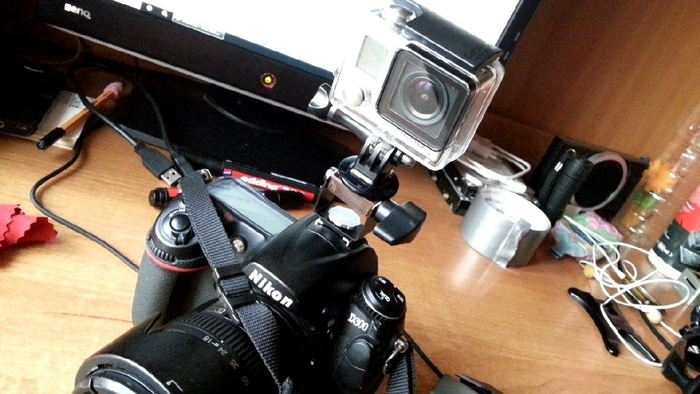 The result is that you can get some really great POV video footage throughout the day. This makes for incredible B-roll to cut to from time to time, and gives an amazing immersive experience for those who are watching. All of this said, this product was initially built for cell phones, so I could see the clamp becoming a problem as GoPro continues to develop smaller and smaller cameras. I did find that while it held the GoPro Hero3 in place well, it still helped to add some extra tension using a rubberband. With that in mind, this was a precautionary measure more than anything, and a GoPro camera could likely take the fall if it was to dislodge from the clamp system. 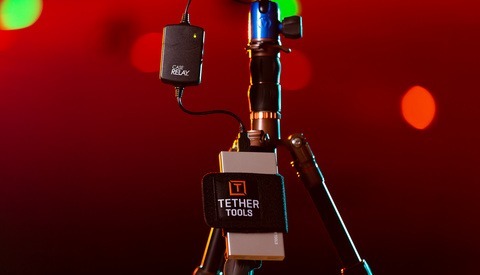 If you're looking to add a new dimension to your BTS videos, I recommend giving the Tether Tools Look Lock a try. 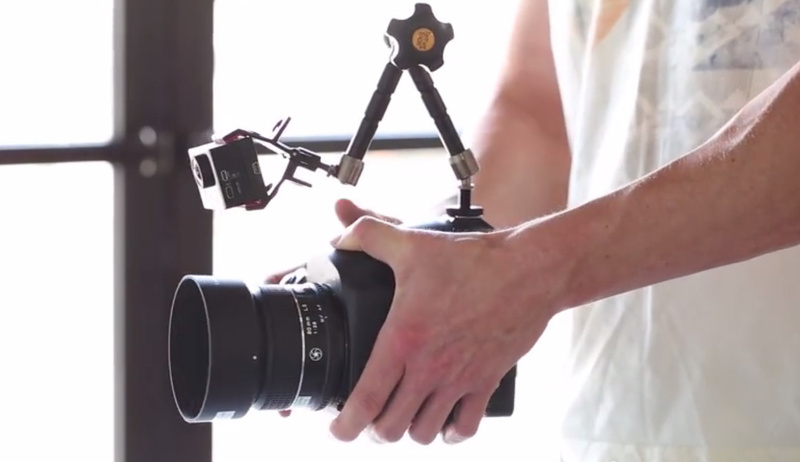 The system is affordable, easy to use, and can add a cool, dynamic style to your next video. The Tether Tools Look Lock is available for purchase for only $74.95. And special thanks to Jimmy Beech and Andrew Foord for helping create these BTS videos. nice! I wonder if they have some sort of attachment that wouldn't take up your tripod mount or hot shoe. 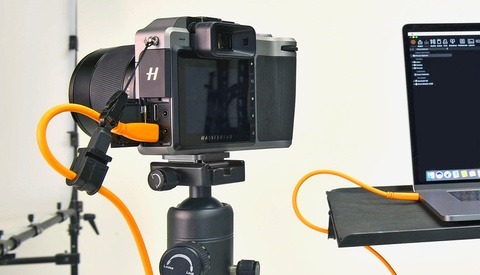 I can easily see myself wanting to use my pocketwizards while on a tripod and being out of luck. 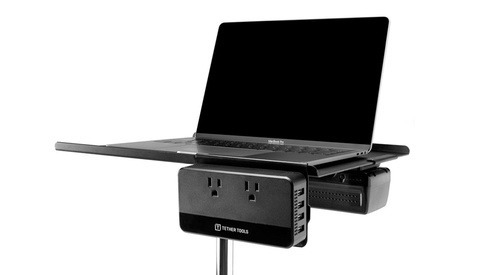 I'm sure there are a million other bracket solutions that could work as well, and might better fit your needs. I just found this one to be really easy to use, and was pretty affordable by comparison. For getting video and stills at the same time, I found I can attach an EOS M2 to my hotshoe. Going to test it when shooting wildlife. Sorry to quibble, but GoPro video of the same subject/angle/timing that you a capturing with your still camera is not exactly BTS. When I am asked to do BTS on my shoots it is practically everything BUT the same angle as the still camera. While it might be useful for a small percentage of a BTS reel, it is not a replacement for actual effort in capturing the a narrative about a project--the essence of BTS.